I’ve made it a goal this year to use up old vegetable seed. I’m sowing it pretty thick since some of it is ancient and germination rates should be down. If nothing sprouts or it all rots in the rain it’s no big deal. I’m just happy to get rid of the packets clogging up my veggie seed box. 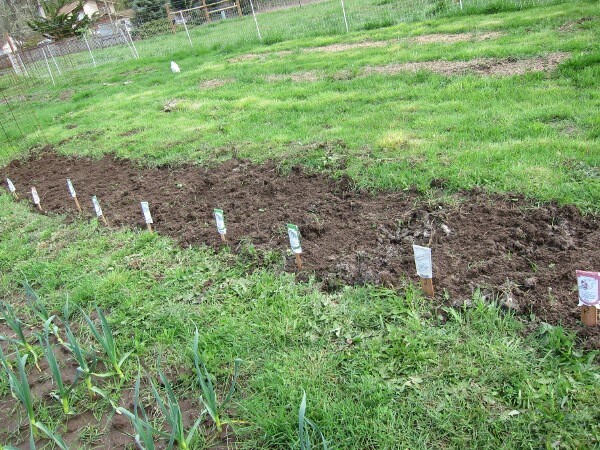 I call the picture below my “2009 garden row.” I’ve heard it was a good year for … um … carrots. Obviously, the 2009 vintage of carrots was so sought after that you can no longer find them in stores. So I’ve heard. I’ve also decided to skip the metal garden label stakes we have and just use split cedar shingles with permanent marker labeling. I’ve found that the wood stakes last longer in the rain than masking tape labels on the metal stakes. What do you all use for garden row labels? I’m actually really excited because I feel so prepared for this garden year. Not that I am of course, but because I went through my Maritime Northwest Garden Guide to find what I can plant this month. Then I sorted through my garden seed, picked out those varieties, and labeled my stakes. All I need now is prepared garden beds and I’m set. I know that Lee has a remarkably good handwriting, so is that your writing or his? That is my handwriting. I was trying extra hard to not be sloppy as my penmanship is bad. I don’t use anything to mark my garden. I try to write down on a garden plan where I put everything but it mostly gets forgotten and then I have no idea what is planted where, lol. I have no guide. I use the weather as a guide since it changes every year. I like your cedar marker idea! I always cut up old plastic containers and write with permanent marker on them. 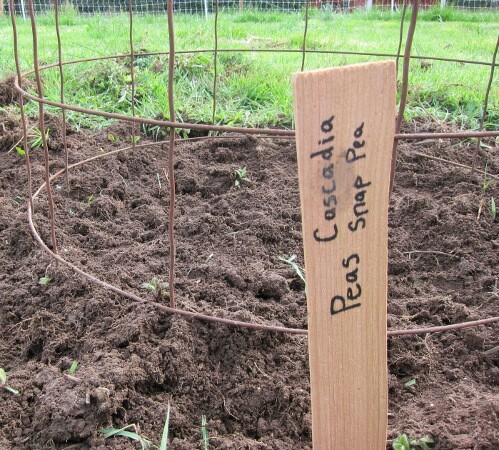 That works fine when they are seedlings… but the sun tends to wipe out the writing in the garden. By the end of the season, I have no idea what is what. I always tell myself that I’ll get better at marking and tracking varieties. But the reality is that I get worse at it… this year I didn’t even bother to put my plastic labels in the ground when I transplanted. I know things are grouped together, but I have no idea which variety is which. I do want to get better, though, since I have observed some big differences between varieties of the same thing. One thought I had was to make a “key” of sorts… and cut shapes out instead of writing. Not real convenient, but no worries about ink washing off or degrading that way. A person could maybe make them out of plastic but tie them on the shady side of the plant so they last for the season. I’m glad to hear that we aren’t the only ones bad at keeping gardening records. We even bought a notebook to use as the official “Gardening Notebook” and it’s never been written in. Every year I say, “We’re going to keep good records this year,” but we never do. Tomatoes are especially frustrating, because we’ve had some varieties that were awesome and some that did nothing and we have no idea which were which. It’s surprising that you got anything from 7 year old onion seed. Those are quite small seeds to have survived so long. Hey, I have stumps too! I have a really annoying one I’ve been digging on for months right by our house. You have to be really careful not to fall in the hole when you walk by it to the car. It’s kind of like a burglar trap. Your place with all the trees is super pretty. Lee wanted some land that had a hill on it and a nice mountain view. We didn’t get that and he still laments over it.